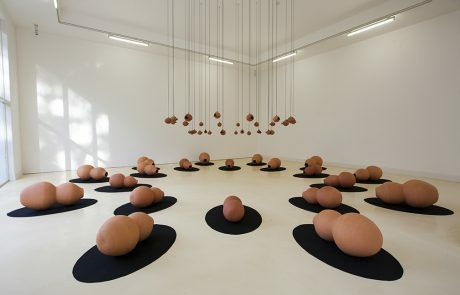 Héctor Zamora (Mexico, 1974) currently lives in Lisbon, where, in March 2017, he presented the performance-installation Ordem e Progresso, the second site-specific project to occupy the MAAT Oval Gallery. 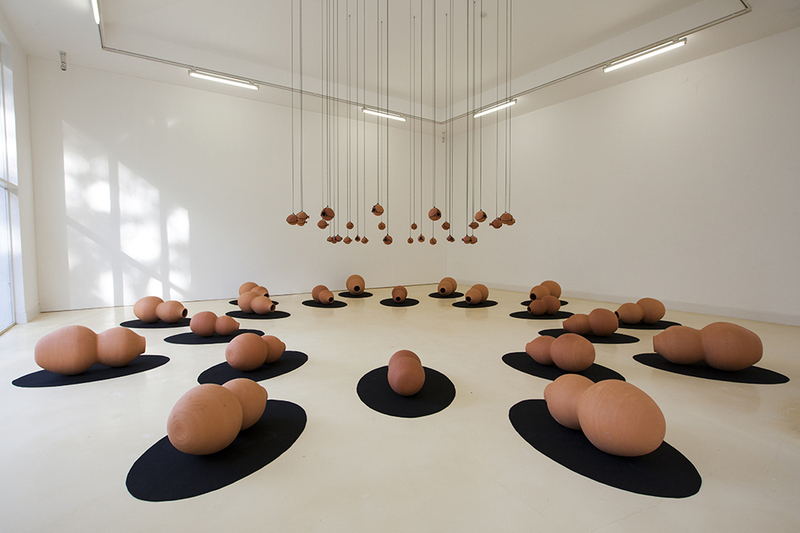 This presentation was part of the first edition of BoCA – Biennial of Contemporary Arts and Lisbon Ibero-American Capital of Culture 2017, in which Zamora was one of the artists invited to join the programme of artistic residencies promoted by Lisbon City Hall through the Municipal Galleries. 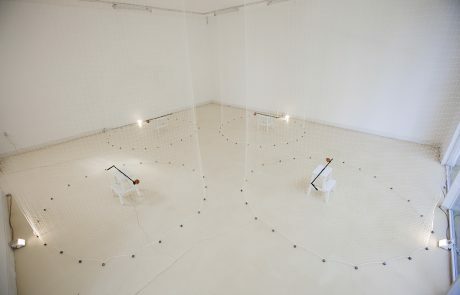 It is in this context that the Centrifugal Vibrations project was conceived and developed, in a format of research and experimentation unique to the residency programme, which initially foresaw a small presentation of the work in the studio in which it had been developed. Composer and musician Victor Gama (Angola, 1960) was soon thereafter invited to take part in co-authoring the design of the entire sound project at the same time as the prospect of involving a full choir emerged. The size and complexity of the project was evident from early on, leading to its transferral from the studio to the Pavilhão Branco. 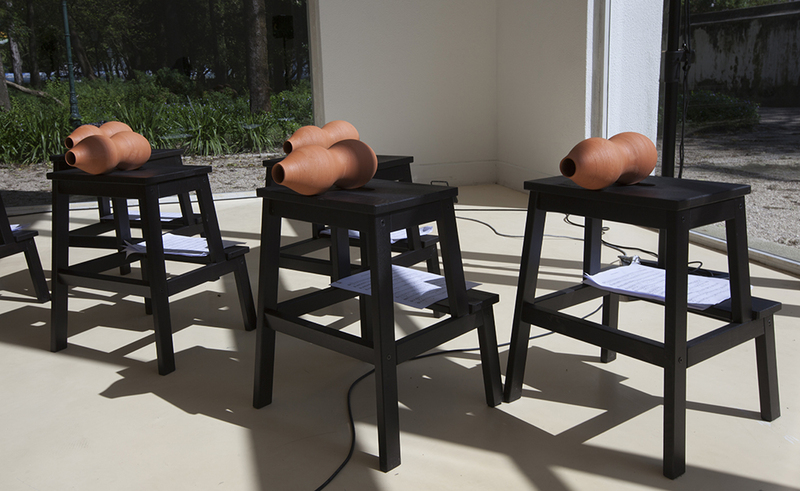 Centrifugal Vibrations is a performance-sound installation inspired by the shape, movement and sound of traditional Portuguese windmills and, in particular, of the ceramic gourds closely associated with them called búzios. Of various sizes and appearing in two different shapes, these ingenious gourds allow millers to use the resonance they produce to measure the direction and intensity of the wind and then manoeuvre the windmill sails accordingly to obtain the highest energy yield. The energy of the wind activates the rotation of the blades and the rods on which the gourds are fixed, whose weight is responsible for balancing rotation. Strategically positioned horizontally and with their mouths facing the wind, the gourds cut against the direction of the blowing wind, resulting in a distinctive sound being produced – the ‘song of the gourds’, as it is popularly known. Thus, from the inside of the windmill, the miller is able to manipulate the blades and align them with the wind in such a way as to optimise and best profit from their operation. 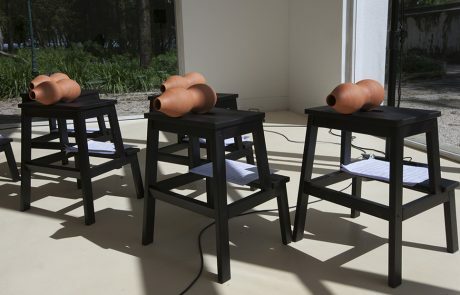 Along with Victor Gama, Héctor Zamora appropriated these objects and their sonority to create a series of sculptural and sonorous installations. 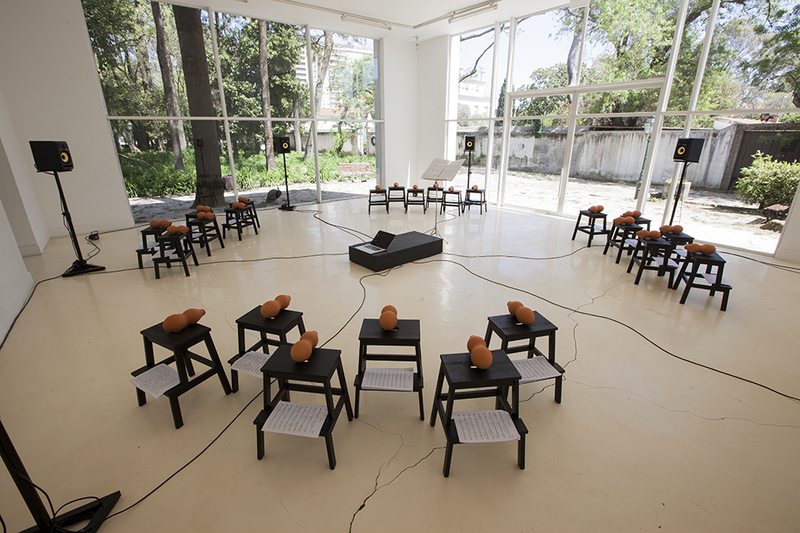 Sound is the main focus of this project, while the multiple possibilities and variations created from interaction with the gourds are interpreted, experienced, edited and organised in a visual composition. Zamora’s artistic practice once again recovers an emerging subject of contemporaneity from a discussion that seemed dormant or unimportant. In today’s industrialised high-tech society, many arts and crafts, techniques, methods, handicrafts and traditions face extinction, and such is the case with these wind- driven mechanical milling devices introduced in Portugal in the 16th century. in an attempt to preserve their structure, original functioning and traditions. The landscape of this region of the country is strongly marked by the long-undervalued presence of windmills, the vast majority of which sit in ruins. 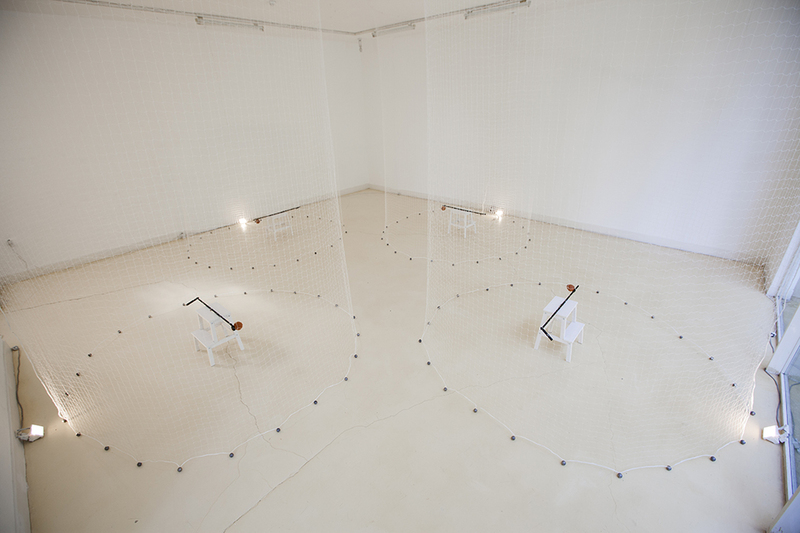 This performance-installation was conceived for the spatial characteristics of the Pavilhão Branco and, thus, was developed in three distinct movements. Each of them represents a physical occupation that is activated as a performative device, emphasising the physical dimension taken on by sound in the space, either by filling the void or through the circuit/pathway it traverses and defines. The actions unfold in an itinerant way on the two floors, divided into short successive performances that, while seeming almost autonomous, are in fact interdependent, creating a narrative that makes up the project. On the ground floor, where the structure of the building separates the space into two symmetrical rooms, the performance is divided into two movements. 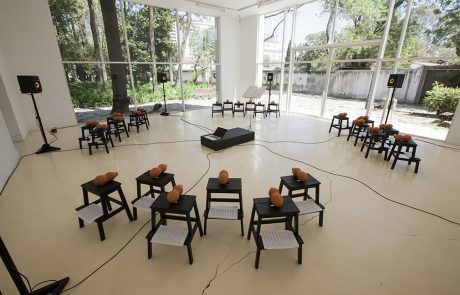 In Movement I, a choir of 24 – divided into four suits and directed by João Barros – performs a piece by Victor Gama, exploring through the plasticity of the voice the hypnotising sonority of the ‘song of the gourds’. The composition incorporates a 6-channel audio recording of the actual sound of the mill, captured and edited by Gama. The choir, positioned in a circle around the perimeter, invites the audience to experience the performance from the room’s centre, with their voices creating the illusion of a multidirectional surround sound system in synchronised centrifugal movement. 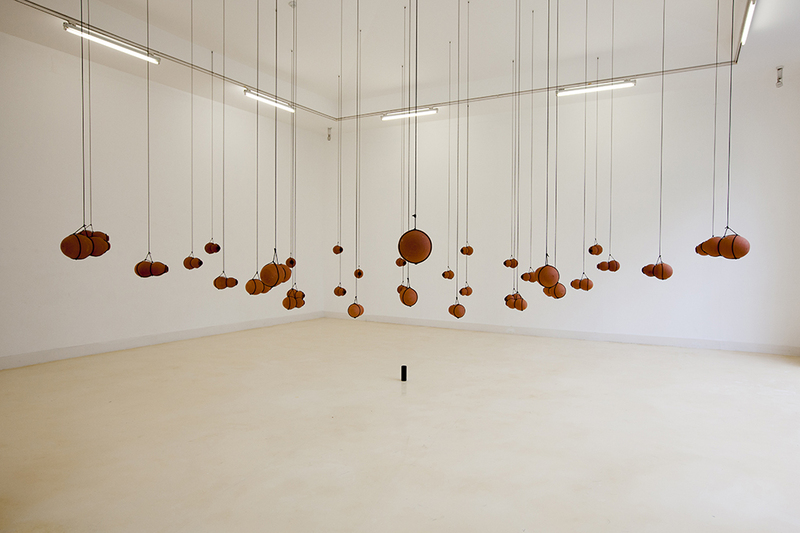 In Movement II, 4 performers use 4 instruments specially designed for this project, and in particular for this exhibition, rotating small jars along a longitudinal axis. These instruments are inspired by the bullroarer, a prehistoric musical instrument from the Paleolithic period, used in ceremonies and rituals. The bullroarer had a rotating mechanism that gave it its characteristic vibration and sound which, at a certain frequency, was capable of being heard from kilometres away, making it an important, sophisticated and fascinating long-distance communication technology. Similar to the manipulation of the bullroarer, the circular kinetics and sound generated are direct references to the windmill, but with an interpretation in which the sonic intensity makes use of a completely different scale and speed. by Victor Gama begins with a certain structure that gradually opens up the space. 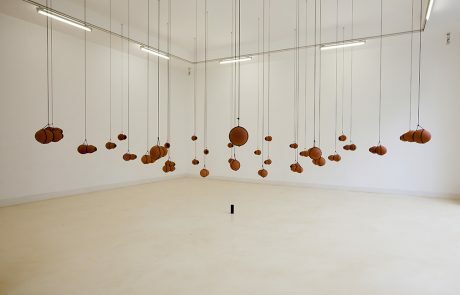 The arrangement of the various pieces in space corresponds to the formation of concentric circles, in which the larger gourds sit on the floor while smaller jars and gourds are suspended from the ceiling, creating a sculptural dimension closely linked to the codes and formalities of ritual. The voices, wind instruments, percussion and centrifugal movement combine to create a performance that awakens the senses and proposes the rediscovery and reinvention of the sounds of the wind. As usual in Héctor Zamora’s work, the exhibition is the result of action. It evokes the memory of space, of time and of people who have determined an event, and whose traces suggests an absence from which a new presence emerges. His works must be received, seen, heard and experienced by people in a spirit of social involvement, as if at that moment they constitute a small community.